This month’s kit is super versatile and has a few blank cards, but also cards that have a general purpose and can be fit to several different occasions, which to me, are the best kinds of cards! Sometimes I feel bad giving a blank card for an actual occasion, so I like when something is not too vague, but general enough to where I can customize it to the needs of the recipient. I’m so excited to take you through this month—I’ll be going through some of my favorite pieces in more detail below! We have a fun bonus gift this month: If you sign up on or before 6/16, you get this way cute sticker sheet! 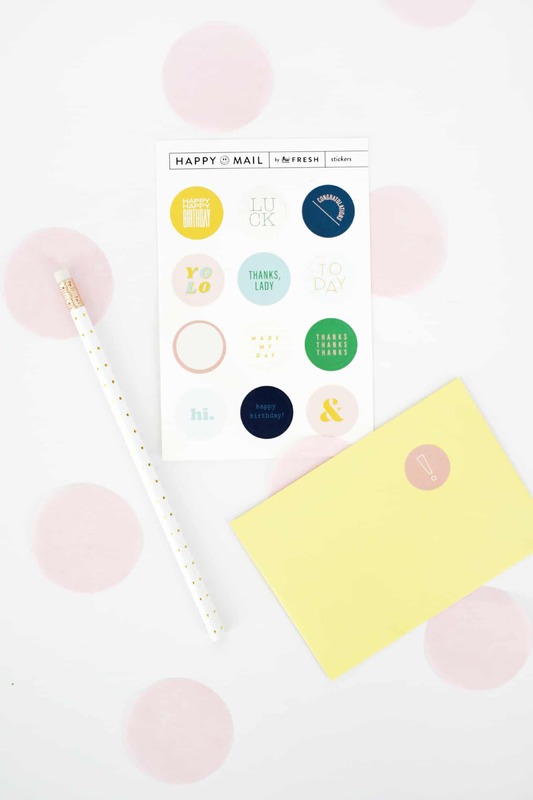 As you can see, they perfectly match this month’s kit and are awesome for sealing envelopes, jazzing up gift wrap, using in your planner or on your calendar—so many things! There’s no code necessary; all you need to do is sign up. This month’s guest artist is the super cool Lana Red Studio, based in The Netherlands. Lana collaged this amazing card, and inside it says “Thanks, Lady” (the letters are also collaged!). Love this card so much!! You can also find Lana on Instagram here. 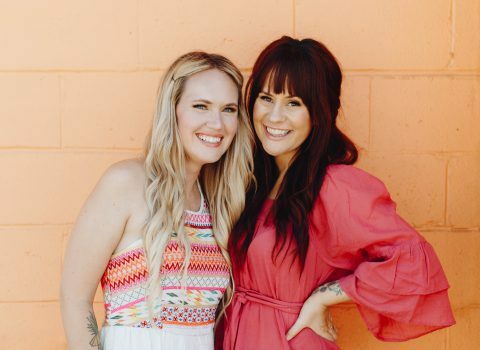 This month, we are introducing *copper* foil into the mix, and oh my gosh—it’s GORGEOUS! 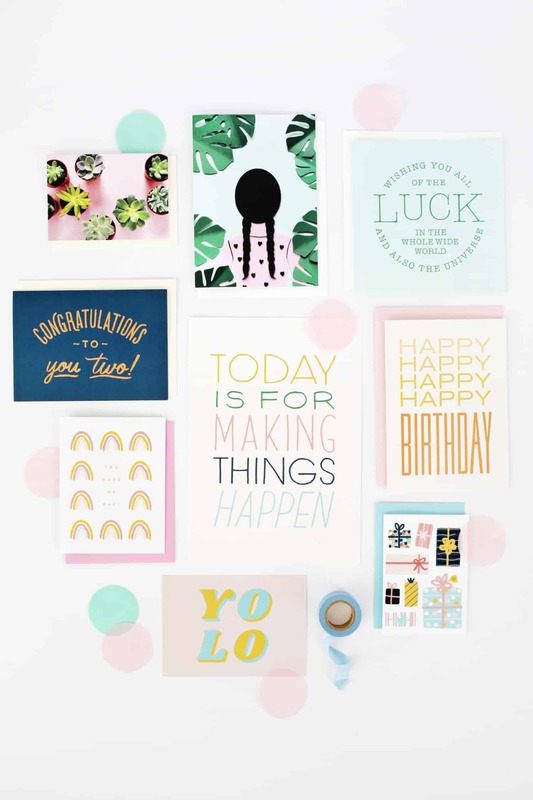 The “Happy Birthday” card is one of my favorites we’ve done. 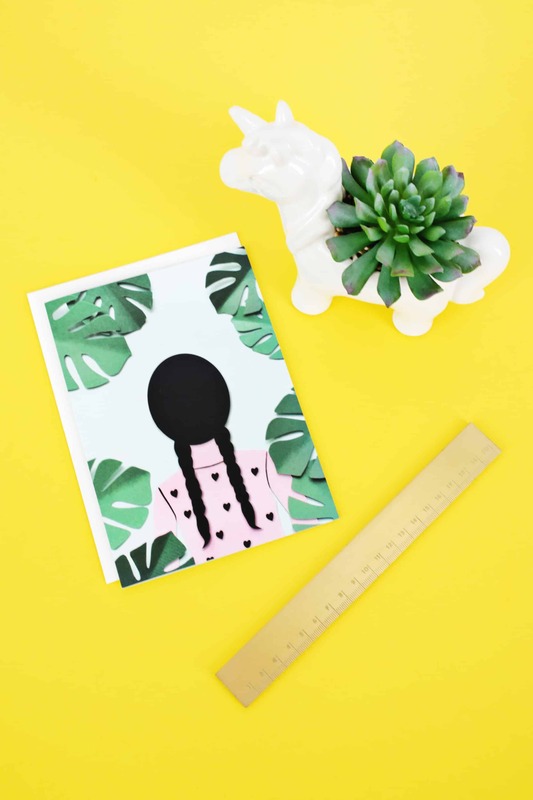 It has such a simple, throwback feel to it and the pink envelope gives it a little extra character and looks so dreamy with the yellow and copper. You can also swap the pink envelope from this card and the white envelope from the “Thanks, Lady” card pictured above if it fits your needs a little better. 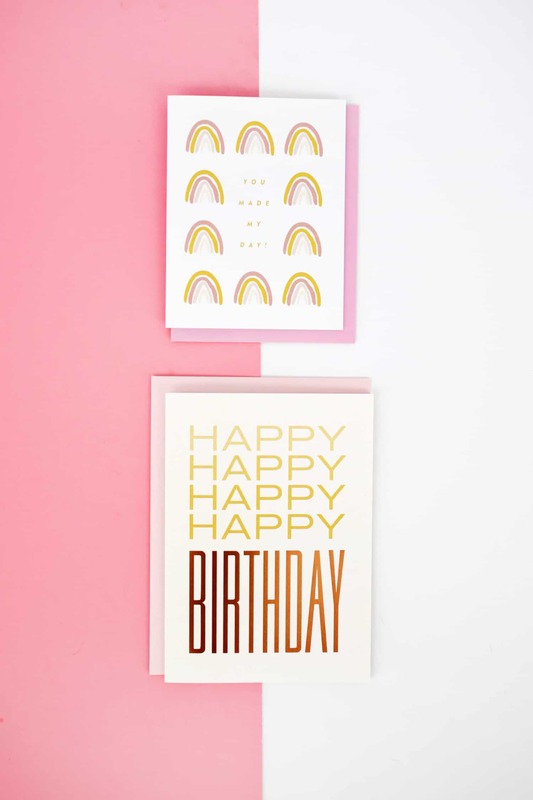 The sweet little rainbow “You Made My Day” card is a great way to say hello or could also be fashioned into a thank you card since it’s blank inside. 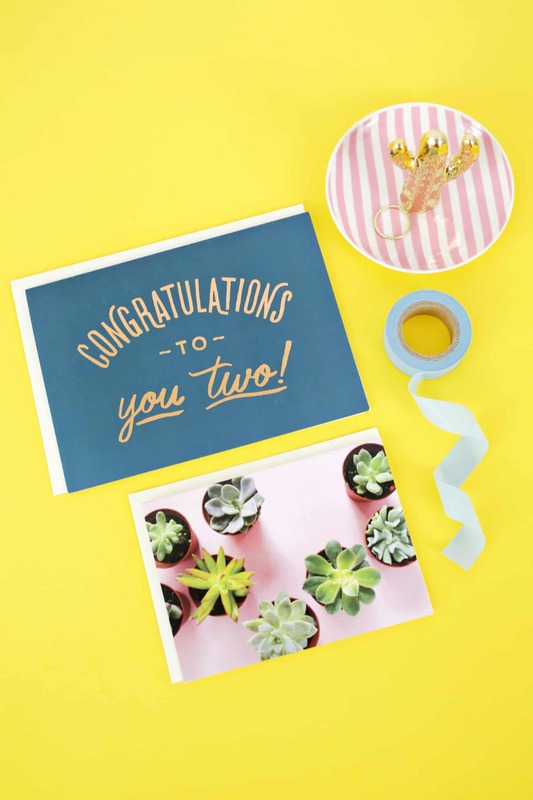 Since I’m not ready to get off the copper foil train, let’s keep this baby moving with this “Congrats to You Two” card! 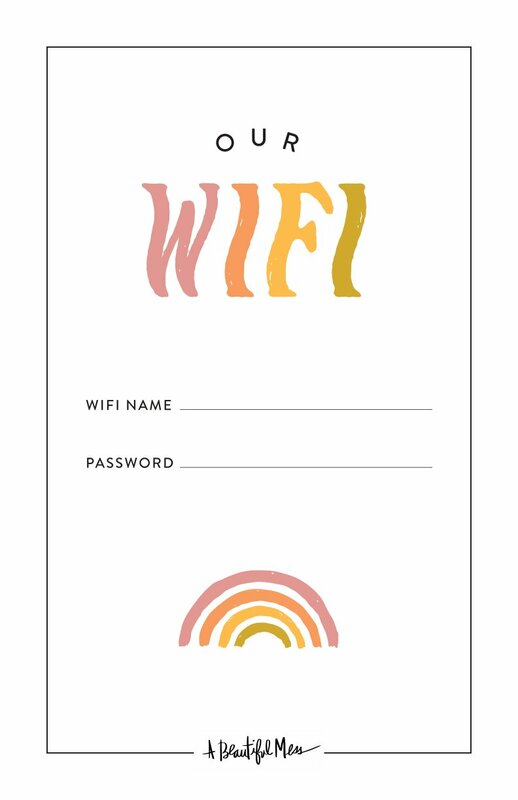 It’s blank inside, so it could be used for a new home, an engagement or wedding, a big move, an adoption announcement—the possibilities are endless! The washi tape in this kit is such a pretty light blue color. From looking way prettier on gift wrap than regular tape and a fun touch to seal cards to more functional things like a safe way to hold the backs of photos in place in a frame, I can never get enough washi tape. This little succulent card is a gem—it’s sweet and petite and can be used for just about anything! 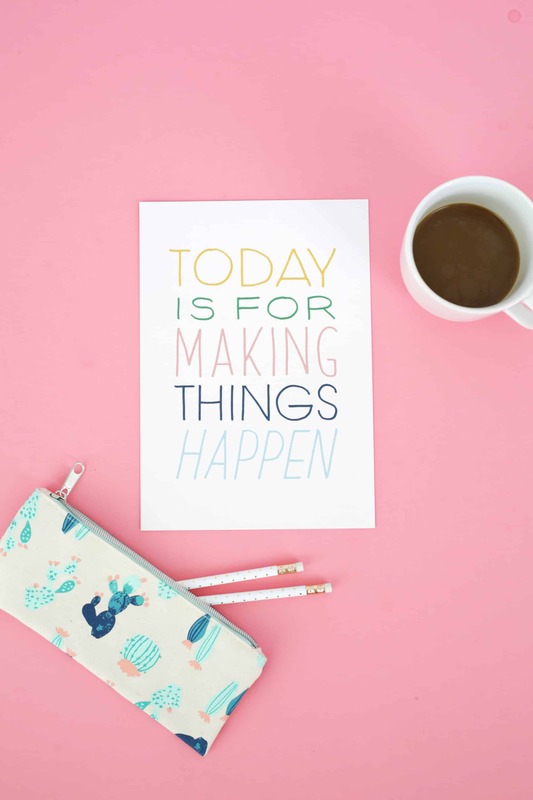 This 8×10 art print is great for a bedroom, office or even a home gym (gotta make those spaces pretty, too)! It’s simple and really darling—lots of colors to love here! 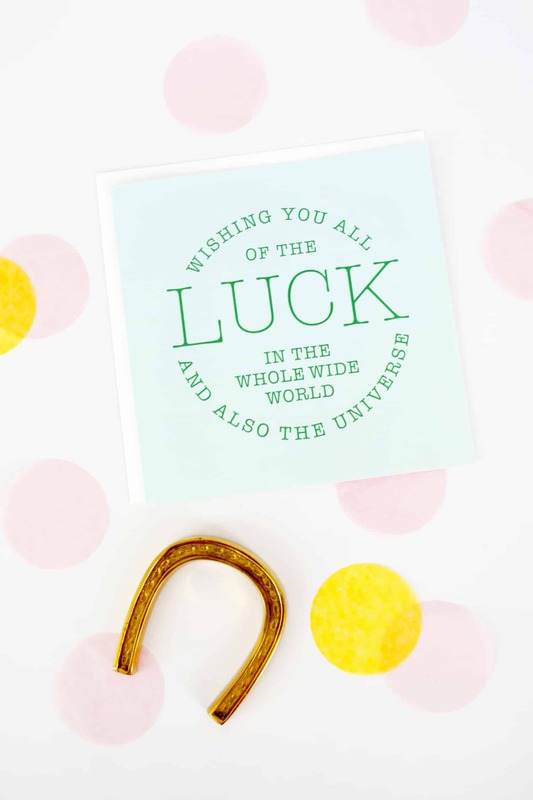 And of course, this “Good Luck” card that absolutely cracks me up. For the times when you realllly want to send those good vibes, haha! This card is nice and big—and square cards always need extra postage no matter what the size. You should be more than good with two stamps on these guys! Click here to sign up for Happy Mail and to make sure you get your free sticker set! They match everything perfectly and are such a fun addition to this kit. We’ll be back next month with another unboxing. Happy Mail ships out on or around the last day of each month—click here for more details on our FAQ page! Credits// Author: Keely Rust. Photography: Laura Gummerman. Photos edited with A Color Story Desktop.